ABUJA — The battle for control of the Senate was last night set to take a more violent form as a campaign group for President Muhammadu Buhari, the Buhari Campaign Organisation yesterday vowed to physically take over the National Assembly complex if Senate President Bukola Saraki does not resign from office. The vow by the group was backed by the All Progressives Congress, APC which, however, said though in support of the group’s intent, it would not join in mobilising for the showdown. The Peoples Democratic Party, PDP, however, cautioned President Buhari to deter his supporters, warning that his name could go in the path of infamy if the administration allows the BCO to carry out what it called a civilian coup. More support also came the way of the embattled Senate President as it emerged that at least 45 senators had signed a letter of solidarity with him, by that undercutting his antagonists who need at least 73 votes in the Senate to remove him. APC senators have also signed a petition for his removal, Vanguard gathered over the weekend. Uncertainty over Senate’s re-convening These developments came as further uncertainty was thrown into the speculated plans for reconvening the Senate. Senior officials in both chambers affirmed ignorance of any plans to reconvene the holidaying lawmakers as desired to resolve issues concerning the budget for the 2019 elections. The plot to storm the National Assembly was revealed yesterday by the co-ordinator of the Buhari Campaign Organisation, Danladi Fasali in Abeokuta, Ogun State during the inauguration of the state secretariat of the Buhari support group. APC backs BCO Supporting the invasion plan, the APC speaking through its Acting National Publicity Secretary, Yekini Nabena said the wish of the people should be respected in a democracy. According to him, if the people have decided to march on the National Assembly, that they were within their rights to so do. “It is the wish of the people and there is nothing anybody can do about that. If the people are saying Saraki must resign, that is their wish. But the party itself will not stage a protest to the NASS,” Nabena said. It’s an invitation to anarchy — PDP Reacting to the threat, the PDP warned that it would be an invitation to anarchy. Deputy National Publicity of the PDP, Prince Diran Odeyemi said: “They cannot do it. If Dr. Goodluck Jonathan bequeathed to Nigerians a good legacy in democracy, we don’t anticipate or expect Buhari to destroy it. Such invasion will be a civilian coup and if Buhari is seeing defeat ahead of him and his intention is to destabilize the country, he should remember that he has a name and that he has a future; he should also remember that he has children. So, invading the National Assembly to impeach Saraki unceremoniously, without following the constitutional procedure, will be total anarchy and Nigerians should hold him responsible for what happens thereafter.” More support for Saraki Meanwhile, solid support came the way of the embattled Senate President yesterday when he formally received a letter of support signed by 49 senators. The letter of support is against the 39 senators who have signed a petition for his removal. That development has put it that 19 senators are in between opinions. 73 senators are required by the constitution to remove a Senate President or a Deputy Senate President from office. 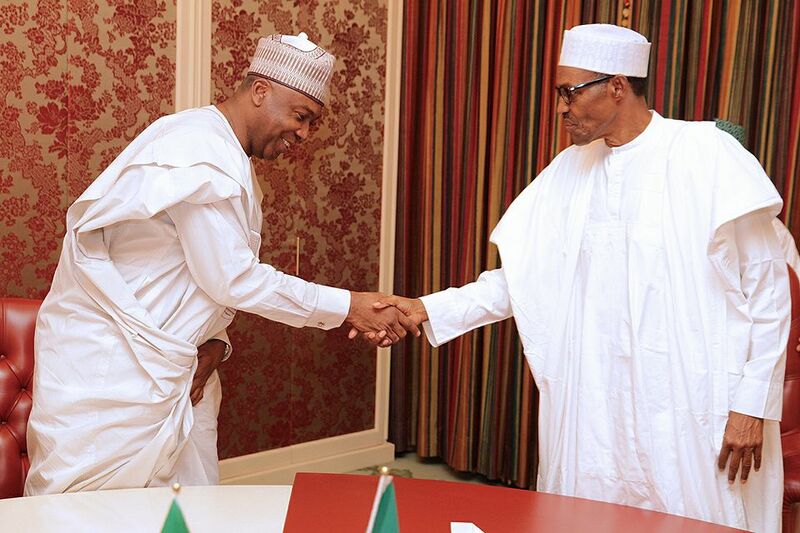 Among those who signed the letter that was delivered to Saraki are former Senate President, David Mark, Senators Jonah Jang, Abiodun Olujimi, Rabiu Kwankwaso and forty- five other Senators of the Peoples Democratic Party, PDP. The PDP Senators include: Senators Emmanuel Bwacha, Barnabas Gemade, Philip Aduda, Abdulaziz Murtala Nyako, Jeremiah Useni, Laah Danjuma, Bayero Nafada, Dino Melaye, Buruji Kashamu, James Manager, Ben Murray-Bruce, Rose Okoh, Enyinnaya Abaribe, Mao Ohuabunwa, Theodore Orji, Sam Egwu, Albert Bassey, Ademola Adeleke, Chukwuka Utazi, Peter Nwaoboshi, Matthew Urhoghide, Samuel Anyanwu, Foster Ogala, and Clifford Ordia. Others are Senators Obinna Ogba, Emmanuel Paulker, Osinakachukwu Ideozu, Suleiman Adokwe, Mohammed Hassan, Joshua Lidani, Sha’aba Lafiagi, Suleiman Hunkuyi, Philip Gyunka, Ahmed Ogembe, Atai Aidoko, Ubali Shittu, Rafiu Ibrahim, among others, Vanguard gathered yesterday that the Senate President got the letter from the PDP Senators weekend, just as they informed him of their vote of confidence in his leadership, and that of his Deputy, Senator Ike Ekweremadu. The Senators in the letter reaffirmed their support for the leadership of the Senate, stating that they are against any illegal impeachment of the presiding officers, while also emphasizing that the plot by the APC to remove the Senators was “dead on arrival” — as the party does not have the required votes to remove both Saraki and Ekweremadu. They have also vowed to in all its ramifications, resist any attempt to remove the presiding officers. It was gathered that the list was meant to serve as a notice to those behind the past botched attempts to remove Saraki and Ekweremadu from office. The letter read: “We, the undersigned senators, hereby declare our total support for Senator Bukola Saraki and Ike Ekweremadu as President and Deputy Senate President of the Federal Republic of Nigeria. We are against any purported illegal impeachment being cooked up by a few minority (sic).” Plans to elect president pro-tempore The moves against Saraki and Ekweremadu Vanguard learnt, however, remain in the works despite recent supplications by some of their antagonists to only use constitutional means. The Saraki camp, Vanguard gathered is aware that once the Senate is reconvened that the two presiding officers, Saraki and Ekweremadu would be physically prevented from approaching the chambers, a situation that would lead to the election of a president pro tempore. “Once the Senate is reconvened, Saraki and Ekweremadu would be stopped by the security agencies from approaching the chambers and a president pro tempore would emerge. It is after that they would now start increasing the bait to woo support to get the 73 votes,” a source embedded in the Saraki camp told Vanguard last weekend. However, how the anti-Saraki camp would lock out the 49 senators supportive of Saraki and Ekweremadu who have the majority remained an issue. Re-convening unlikely Apparently on account of the lack of trust, expectations of the reopening of the Senate and House of Representatives tomorrow are far-fetched, according to normally reliable sources in the National Assembly. The notice to reconvene the legislators was yet to be issued by any of the clerks of the National Assembly. Enquiries directed at the speaker’s office indicated that as at Sunday night, there was no official communication from the office of Clerk of the National Assembly indicating that the House would break from its vacation this week. Notices of resumption on an emergency basis have always emanated from the office of the Clerk but a top source told Vanguard that there is none at the moment. “I am not too sure the House will reconvene on Tuesday. The Speaker’s office has not said anything. There is no official communication from the clerk. Such is always the case. There must be a communication from the clerk to reconvene the house. “Recall the case of the 7th assembly under Tambuwal. There is a notice, even though it was an emergency. It was the deputy speaker that said the House will reconvene but we are yet to see that,” the source said.